After making this quilt four times I think I can make it in my sleep. I hate watching movies twice (Disney movies don’t count! 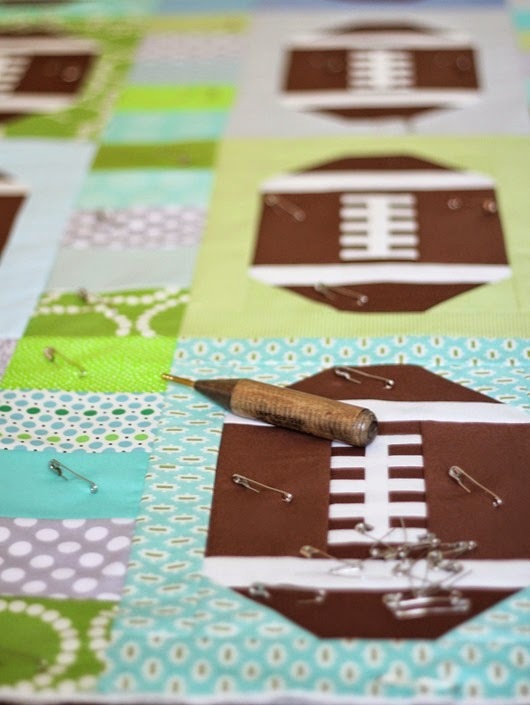 )….but I actually don’t mind making the same quilt a couple of times because I can semi-not pay attention and just sew…and eat…and watch TV….while I sew. It’s perfect. This time I used an unknown white fabric from my stash that was a tiny bit stretchy…it made sewing the “laces” a beast. Starch, gentle pressing, and an accurate seam are your best friend with those suckers. 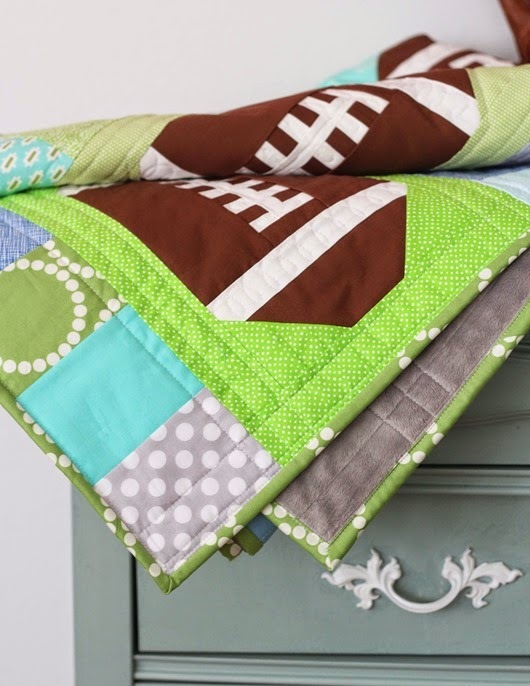 The back is the softest cuddle fabric….and the quilt was gifted last night to a soon-to-be born Seahawks fan. 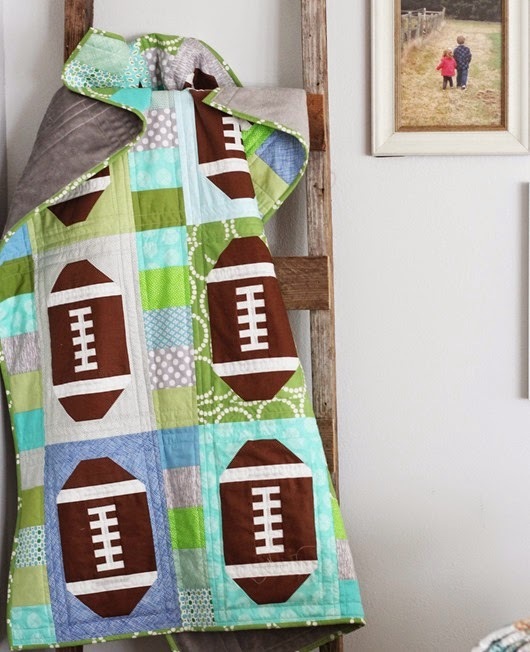 :) Now I’m done with football/football quilts for a looong time. P.S. For those that asked the brown fabric is a Kona solid in Earth…best brown ever. Pattern is Touchdown. I just finished making the larger one of these for my football playing grandson's birthday in his school colors. I hope he loves it as much as I do. I concur – Kona Earth best brown ever! Where did you get your backing? Is it Minky? I like the colors you've used for this quilt. Very cute!! Great quilt! I'm sure they're going to love it!!! Love the quilt!! Just a question about the back, did you also use batting with the cuddle fabric?? Ive been wanting to try that, but been afraid it would make the quilt too thick. What a cute quilt! Love the design and fabrics. Gorgeous! Also where did you get that awesome quilt ladder? I am so looking for one! I don't think you mentioned on the blog that your fabric is featured in the newest issue of "Love of Quilting!" I spotted it right away and it looks GREAT! Cute pattern. I still can't believe our SEAHAWKS won the Super Bowl! I still get chills when I think of it! Such a fun pattern! I have a couple friends that are working on this pattern. One is making five quilts as gifts and the other is making two (Vikings and Packers versions) for a charity auction this summer. Love that pattern, bought it! I used a Moda marbled brown I had in my stash. Awesome quilt! It's a great quilt. You've done a beautiful job with it. Perfect for any football fan!